The elegance that is shown by the New Maria Club Chair is something absolute. This chic furniture suits even the five star resorts, villas, and hotels. Creating a cozy living space is what this chair can do the best, apart from the other features offered by this synthetic wicker furniture. Placing the New Maria Club Chair can be a calm retreat at home that you might need after dealing with the heavy works all day long. 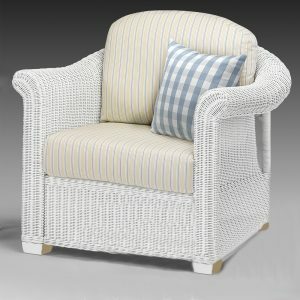 This synthetic wicker chair is certainly a practical chair, performing the simple yet chic sight in your living room. Mixing and matching contemporary and classic styles, the New Maria Club Chair comes alive with colors and affection. Foam is a versatile material than can be used to revive old furniture seats and cushions. In fact, a growing number of furniture owners are using foam to update everything from chairs and couches to benches and outdoor patio seats. Many people prefer working with foam because it’s affordable, flexible, and extremely easy to use. If you’re in the market for upholstery foam, you might be overwhelmed with the many options for sale. From flexible polyurethane foam to Dryfast outdoor foam, there are countless types of foam to choose from. But fret not. With a little research and helpful information, it’s easy to find the foam you need for your DIY upholstery project. Use the following tips to find upholstery foam according to your project requirements. Choose the right foam retailer. Before you can buy foam, you will need to find a trusted retailer. Whether you find one online or at your local mall, make sure that the retailer specializes in foam products. This means that the retailer’s main business is selling foam. Purchasing upholstery foam from a specialized dealer such as Canada Foam by Mail ensures that you’re getting a higher quality product. In addition, a specialized foam retailer will know more about foam than a mega retailer that sells thousands of different items. The right foam retailer can answer all of your questions and help you find the right type of foam your project. Find the right type of foam. When searching for upholstery foam, you will need to narrow your search based on the type of furniture you plan to revive. For example, if you need foam to replace couch backing cushions, we recommend super soft foam. This foam usually lasts about five years and can also be used as a mattress or a mattress topper. If you need longer-lasting foam, consider high quality upholstery foam, which lasts up to 16 years. Outdoor furniture and marine seating also requires different type of foam. If you plan to use the foam for outdoor patio furniture or boat cushions, it’s important to buy outdoor-ready foam. Outdoor foam is designed to withstand rain and other outdoor conditions without falling prey to mold and bacteria. Purchase the right amount and size. Many foam retailers sell foam in standard sizes and shapes. However, the right retailer can custom cut foam to fit your needs. It’s important to properly measure the cushions or seats you plan to replace. Then, use the measurements to order new foam. You can ask the retailer to cut the foam, or purchase large sheets and cut the foam on your own using a using an electronic knife or sharp carving knife. Canada Foam by Mail offers a variety of foam products, including upholstery foam in Canada and polyurethane foam in Canada and around the world. A bit of foam can drastically alter the appearance of any room. You can add upholstery foam to old and sagging couches, or reupholster furniture and repurpose other items to create the shabby-chic look. The result beautifies the home, but serves to keep things at a cost-efficient price. Simply changing the upholstery foam on any piece of furniture creates a fuller appearance and instantly revitalizes the older piece. Give sagging couches a face lift without paying costly fees to refurbish them. Changing the upholstery foam also makes furniture more comfortable, as it’s plusher and more buoyant. Take off old upholstery and any old staples from the dust cover, unfasten the frame of the furniture and remove the old upholstery foam. To refill, measure and cut the new foam and then seal the upholstery with tacks, staples and other methods. A bay window provides a beautiful focal point to the room, a relaxing retreat to have morning tea or coffee, and adds dimension to any room. Create a comfortable place to sit in your bay window by adding upholstery foam covered with fabric that accents the surrounding décor. Simply measure the area that needs to be covered and cut the foam according to those dimensions. Then cover the foam with fabric to complete the look. Add pillows and a throw blanket for extra elegance and comfort. Covering a chest with upholstery foam and fabric provides a nice seating area—whether the chest is situated at the foot of a bed or casually along a wall. You can also extend the size of you bed by laying discount memory foam mattress over pieces of furniture that are level with the bed, like a chest or an ottoman. Add upholstery foam to anything imaginable to create something new. Any flat surface, that has sturdy legs and upholstery foam added to it can serve as a stool, bench or ottoman. By getting a cost-efficient mattress from Canada, one’s budget can stay at a minimal amount. Decorating on a budget is completely possible; it just requires looking at old things in a new way and thinking out of the box by repurposing items. Using old pieces of furniture to create new accents for the home is also a fun hobby. By purchasing upholstery foam from Canada, you can keep costs low while revitalizing your home. You may have never considered the benefits of replacing your old door on your house. “My door works just fine,” you may say. But you might not be aware of the amount of money that can be saved and earned with a new door installed on your house. Replacing old doors have numerous aesthetic, financial and energy saving benefits that you just shouldn’t go without. Replacing an old door is easy, and there are so many selections that you can choose from, that you’re bound to find something that fits the size of your house. Replacing your old door is considered to be environmentally friendly. Being environmentally friendly isn’t just a trend; it can save you a lot of money too. New doors are especially designed to insulate your house from the outside cold and heat. If you live in extremely hot or cold environment and you find that you are spending a fortune on heating and cooling bills, you may want to consider how your doors are affecting your airflow in your house. Through the process of diffusion, hot air will want to disperse to cooler locations. This means if air can pass easily through cracks in your door, your cooling system has to work extra hard to keep the house cool. If you aren’t replacing your old door, this means higher energy bills for you. Consider also that if you do choose to switch to an environmentally friendly door, you can apply for a $500 government tax credit. That’s pretty neat, isn’t it? The door practically pays for itself. Replacing an old door can increase resale value. If you haven’t been made aware, there’s a shift in how prospective buyers are examining homes on the market. Curb appeal is crucial. If your doors don’t compliment the style of your home, it can be an eyesore. Conversely, replacing your old door to a beautifully upgraded door can make a huge difference. Energy efficiency, explained in greater detail above, is a top priority for home buyers these days as energy rates are continuing to climb. Upgrading to an energy star certified door is very attractive to new buyers and can increase your resale value. New doors are inherently safer because they’re stronger and the locks are harder for criminals to break. ROI is also important for you and whether you sell your home or not, window and door replacement ranks for the top 5 highest return on investment for your home. Eighty to ninety percent report some kind of return on investment. Should You Get a King-Size Bed? When the time comes to buy a new mattress, selecting the size you want is always a difficult decision to make. Often, the rule of thumb is to purchase the largest mattress you can. Full-size bedroom furniture can take up quite a bit of space in a room however, and the cost of the largest sets may be out of your price range. But if you have plenty of room and are able to afford it, here are a few reasons to opt for a king-size bed. Space! If you’ve ever spent a night on a twin-size bed or crashed on a friend’s couch, you’re well aware of how important having enough space is to comfortably relax and fall asleep. A contemporary king bed measures 76 by 80 inches, more than enough size to stretch out and adjust through the night. Room to grow! If you’re recently married or are starting a family, you may realize your old full-size mattress isn’t big enough for two adults to comfortably share. And with kids, you will inevitably have additions to your bed in the middle of the night or early in the morning, taking up more space. With a king, there’s room for everyone. Complete a Room! While this may be the opposite of the problem many people have, some individuals find themselves with too much space in their bedroom. In rooms that look sparsely furnished with only a full or queen, king size platform beds or canopy beds can fill a room and make it feel comfortable rather than awkward. If cost and space aren’t an issue, king-size beds are the most luxurious way you can get shuteye!